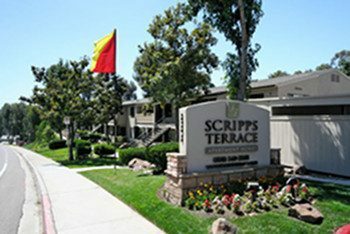 Scripps Terrace Apartments is a 67-unit apartment community located in the tony Scripps Ranch neighborhood in northeast San Diego. It was built in 1983, and was purchased by SCP from a private investment group in March, 2007. Situated on a high-visibility site close to retail and convenient to the I-15 Freeway, the property had clearly been surpassed by both new and recently renovated apartments in its submarket. The property was owner-managed, and had a tentative condominium map in place. Scripps Ranch is a coveted address, with great schools and a superior quality of life. There are only a handful of apartment communities in this desireable neighborhood. If it could be improved to a level comparable to the competition, its quality location would enable it to drive to higher rents. SCP embarked upon the renovation immediately after acquisition. Featuring two-story buildings with surface parking and a relatively open campus, Scripps Terrace offered the chance to improve upon a living environment that is less dense than some of the 3 and 4 story buildings found in the market. Our mission was to highlight these low-density features, with a strong emphasis on landscaping and resident amenities, including the swimming pool and sundeck area. At the same time we modernized and significantly upgraded interiors, and added central air conditioning to each Scripps Terrace apartment home. We squarely hit the mark. Scripps Terrace was elevated into the upper mid-range of properties in the submarket, and since has consistently maintained that position. Scripps Terrace was sold in 2014.